For strange reasons, many people, especially women avoid wearing glasses. They are of the opinion that glasses ruin their appearance, making them look ugly. Some say they are not used to wearing glasses longer than an hour, others simply do not want to carry an additional weight on their nose. No matter what the reason is, the only way to substitute glasses is either having an expensive eye surgery, to correct your eyesight, if it is indeed subject to surgery, or get a pair of lenses. Lenses are a favorite choice not only for those with eyesight problems, but also those who like changing the color of their eyes, by always buying a couple of lenses for different occasions. There are principle rules to follow when using contact lenses, not to harm your eyes. Below are several makeup tips for contact lens wearers that should be followed to avoid any problems in future. First of all clean your face and wash your hands prior to your makeup procedure. Remove any applied creams or scrubs from your face. 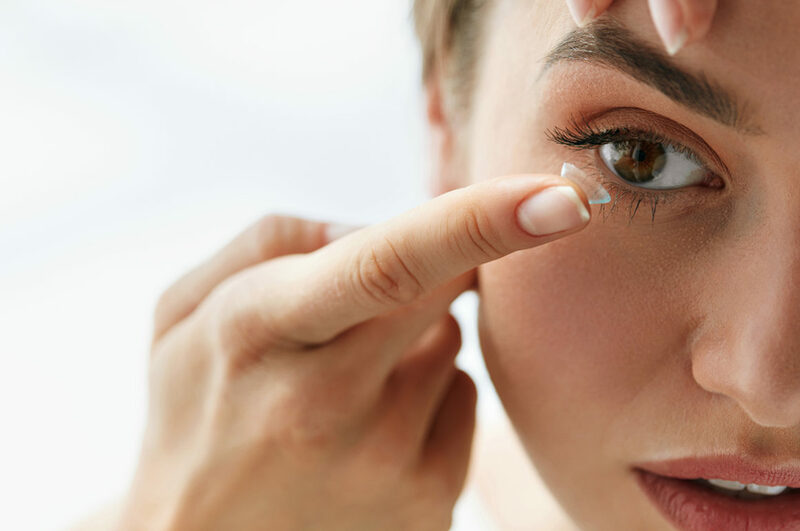 If any other substance gets in contact with a contact lens, this can cause a serious infection and irritation of eyes, especially if they are too sensitive. Wash your hands thoroughly with a mild soap and dry them carefully with a clean towel. Handle the lenses with your fingertips. Avoid contact with your fingernails. For safety reasons, keep your fingernails cut short. Always put the contact lens prior to your makeup. It will be easier for you to start the makeup procedure with the lens already on you. Besides, you will see clearly, how you are applying the makeup. Always pay attention to the quality and the date of the products. Low quality cosmetics, especially those for eyes, will create unwanted problems for you. Best choice of any smoothing substance is hypoallergic ones. If you are applying powder, then close your eyes, so that nothing falls into them and create irritation. When it comes to an eye-shadow, avoid powder ones too. You can use liquid eye – shadows instead. 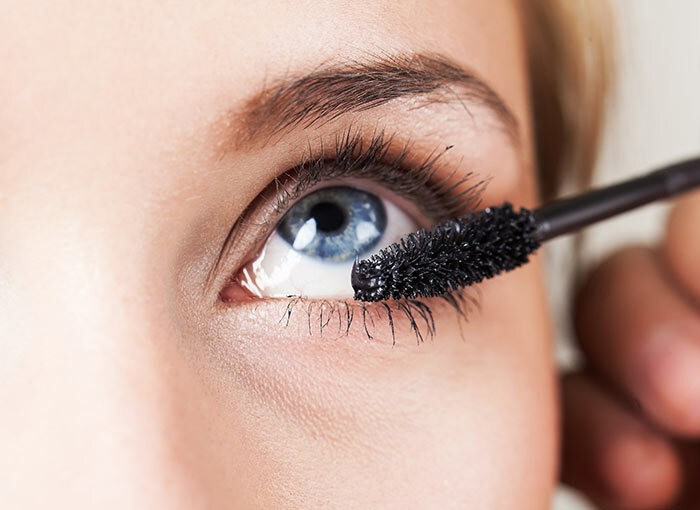 To finish the makeup of your eyes, apply waterproof mascara. Try not to get too close to the base of your eyelashes. Never apply eyeliner between your lashes and your eye. You can apply it on the area of your lashes that is away from your eye. It is better to style your hair before the makeup. Since you may be using sprays or hairdryers, the act may be inconvenient and will require much care. You will have to close your eyes before applying the sprays. So, best do your hair first and then pass on to your face. When it comes to removing the contact lenses, start from the first tip. Wash your hands again, remove softly the lenses first, and then only clean your face with special makeup removers. In order to remove the lenses correctly, look upward or sideways. Gently maneuver the lens onto the white of your eye with a finger, then gently pinch the lens together with your index finger, thumb and lift it off the eye. Do not forget to put the contact lenses back to their place. Keep the latter in a separate case, closed hermetically, so that no contact with any of your perfumes can occur. It is also necessary that you take care of the lenses on regular basis. You should clean the contact lenses with a cleaning solution and rinse them carefully. Make sure that the cases you keep the lenses in are also cleaned thoroughly. If you are not going to wear the lenses for some period, put the latter in a special disinfecting solution. If you follow our beauty tips, you will avoid any serious irritation of your eyes. You will have a stunning look without those glasses that always bothered you. Only keep in mind that your eyes need rest. So do not overuse the lenses every single day. Let your eyes rest at least once a week.